More PC makers are bringing Android to desktops as users increasingly turn to the Internet for apps, storage and entertainment. Lenovo and Hewlett-Packard showed inexpensive all-in-one PCs running Android at the International CES event in Las Vegas this week. 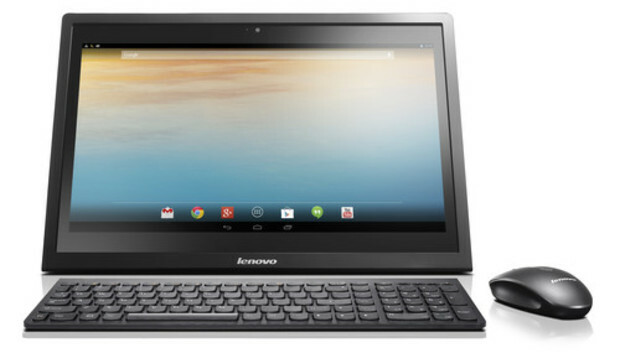 The US$450 HP Slate 21 Pro has a 21-inch screen, and the $399 Lenovo N308 has a 19.5-inch screen. Android is mostly used on tablets and smartphones, and PC makers are trying new desktop usage models with Android on large-screen PCs. The use of Internet-based applications, entertainment and storage services is growing, and Android is designed for that type of computing, said Nick Reynolds, Lenovo's executive director of marketing. "Everyone is finding they have an explosion of personal digital content and they need to store and manage it," Reynolds said. "It changes the way people are working with their traditional desktop." Android was also loaded on to high-definition professional monitors, seemingly as an afterthought. Lenovo's ThinkVision 28-inch 4K monitor is primarily designed to be used as a professional display, but can also function as an Android all-in-one PC. Acer's $1,100 TA272 HUL is a 27-inch professional display that also doubles as an Android all-in-one when needed. Windows is designed more for desktop computing, while Android all-in-ones would be a great hub for communications, home automation and online entertainment, analysts said. The PC makers view Android all-in-ones as hub computers in offices or homes that can sync easily with public or private cloud services. "Most of the Android AIOs are essentially smart monitors, which I think makes them still a bit different -- and certainly less powerful -- than a true PC," said Bob O'Donnell, principal analyst at Technalysis Research. Android all-in-one adoption could grow as more apps migrate to the cloud and hybrid computing models, said Jim McGregor, principal analyst at Tirias Research. "Throughout this year, you will see more and more productivity apps go that route using Android and iOS, which really weakens the argument for traditional PCs," he said. The Android PCs are based on ARM processors and cheaper to build than Windows PCs, McGregor said. ARM processors are less expensive than Intel chips used in Windows PCs, and Android is virtually free. "You eliminate the Windows license fee and you can use a mobile processor that is a fraction of the cost of an x86 processor. That simplifies your system design because it is easier to [build] and the overall design can be much simpler," McGregor said. Beyond the cost, HP also liked Android for its Slate 21 as the OS could be heavily customized. The company has modified Android with specific software and fine-grained management and security features designed so that a fleet of Slate 21 PCs could be easily managed in corporate environments. But there are challenges for Android all-in-ones. They are not designed to run high-end applications, and like mobile devices, are most effective when connected. Also, most Android apps are written for mobile devices, and questions remain on how effective those apps will be on all-in-ones, where touch input is secondary, O'Donnell said. "My guess is we'll see some application compatibility problems and other issues that could be a problem for market success," he said.